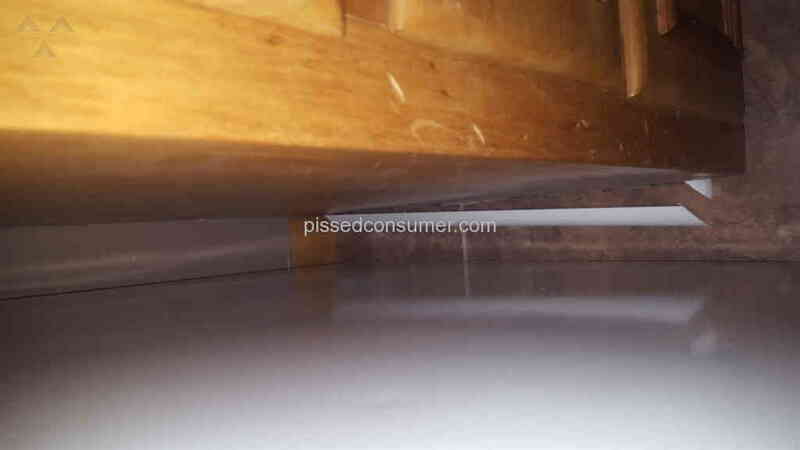 We’ve read your review, and we’re disappointed in the issues that occurred during your installation. We would like to follow up with you to learn more about your experience and ensure that all your concerns get addressed. However, we are not able to locate your account with the information posted here. Please send your contact information to customersupport@empiretoday.com so that we can locate your account and follow up with you. We had a rep come out 3 weeks before thanksgiving. Sold us laminate flooring and booked an appoinment for us. We were having a large job done. Ripping up old carpet and tile in a foyer, hall, kitchen and breakfast area. This was supposed to be a 2500 job. That following week, one guy (not a crew) came out, was here 1p minutes and said "i cant do this. You need to have your tile tested for asbestos." I had taken the day off for this to get started. So i shipped off 2 samples to a area lab to be analized. After 100 dollars and another week it came back negative. So, on we go. Took another day off for the floor to be laid and a crew arrived to start ripping up the floor. 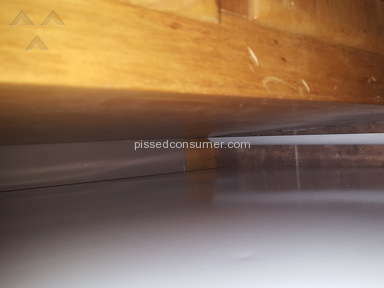 At one point, the installer tells us, "we cant lay laminate floor on this, its not flat enough." So again, they pack up and leave and have to wait for a tile salesman to arrive. So we wait, and wait, and wait....9:30 pm he shows up. We are offered a selection of tiles (mainly luxury tiles). Let me tell you this, this is not cheap. So, with a new subfloor needed, grout, tear up....blah blah blah. Our 2500 job went up to $5400. Cha ching! Apparently they saw deperate suckers on our face. Of course, they cant do this before Thanksgiving. Soooo, our floor was tore up when family came over. Fast forward to the following Thursday. Old tile, subflooring coming up, tile going down. (Hubby took that day off). Friday i took off and the grout was supposed to go down. 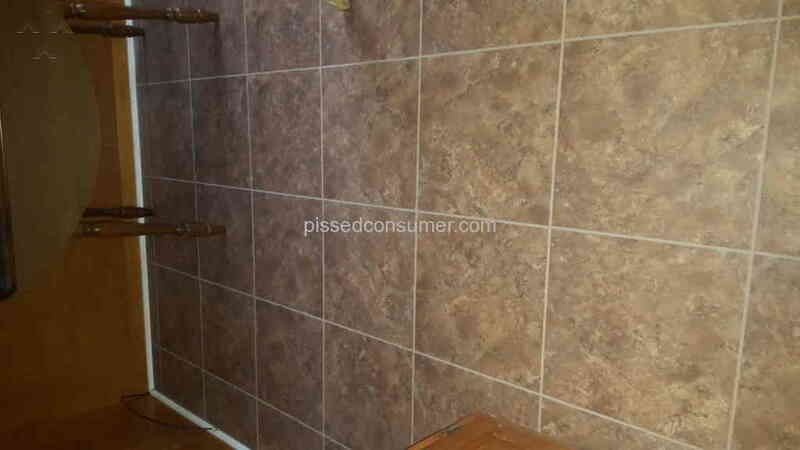 The grout i picked out was aweful so they said we'll call and have someone deliver more. I asked what time will it be, because i had plans for my birthday with my kids. They said, couple hours maybe. That was 1:00 pm. At 6:30 pm, still no show and i had to cancel my plans. At this point im so frustrated with this company im in tears. 7:10, the guy shows up, 2 minutes to drop the buckets, forgot to leave the metal strips for between the rooms. So, next day, guys call, say they have to pick up these strips and theyd be out. This is Saturday. End of day...still not finished. Sunday...they dont work. Finally monday, one guy returns to finish the round molding. Packs up early and leaves. Unbeknownst to me, he left molding undone, and forgot a strip behind my refridge. They dida good job laying it other then that. However, it seemed like they were on the phone all the time. They turned on their own music, which id been ok with if they would have asked. I wasnnt feeling well and fighting a cold. Since that time, they have not contacted us to see how things went or followed up. Will NOT use them again. 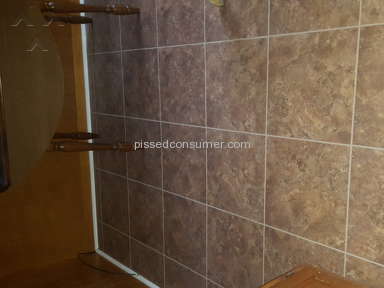 Not because im not satisfied with the tile, but because of the ridiculous hassel we had to go through. Review #751698 is a subjective opinion of Nopatience. We’ve read your review, and we’re disappointed in the issues that occurred during your installation. We would like to follow up with you to learn more about your experience and ensure that all your concerns get addressed. However, we are not able to locate your account with the information posted here. 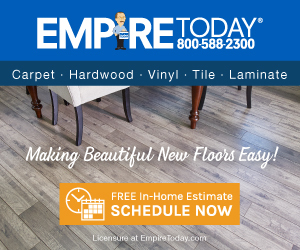 Please send your contact information to customersupport@empiretoday.com so that we can locate your account and follow up with you.